Course Description: Participants must bring a laptop as completion of the online test is part of the course. 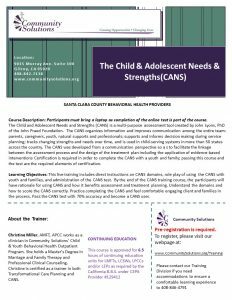 The Child and Adolescent Needs and Strengths (CANS) is a multi-purpose assessment tool created by John Lyons, PhD of the John Praed Foundation. The CANS organizes information and improves communication among the entire team: parents, caregivers, youth, natural supports and professionals; supports and informs decision making during service planning; tracks changing strengths and needs over time, and is used in child-serving systems in more than 50 states across the country. The CANS was developed from a communication perspective so a s to facilitate the linkage between the assessment process and the design of the treatment plan including the application of evidence-based interventions Certification is required in order to complete the CANS with a youth and family; passing this course and the test are the required elements of certification. This live training includes direct instructions on CANS domains, role play of using the CANS with youth and families, and administration of the CANS test. By the end of the CANS training course, the participants will have rationale for using CANS and how it benefits assessment and treatment planning. Understand the domains and how to score the CANS correctly. Practice completing the CANS and feel comfortable engaging client and families in the process. Pass the CANS test with 70% accuracy and become a CANS user. About the Trainer: Christine Miller, AMFT, APCC works as a clinician in Community Solutions’ Child & Youth Behavioral Health Outpatient Program. She holds a Master’s Degree in Marriage and Family Therapy and Professional Clinical Counseling. Christine is certified as a trainer in both Transformational Care Planning and CANS.